Everyone has to begin from somewhere, most importantly; it has to be fun and enriching. 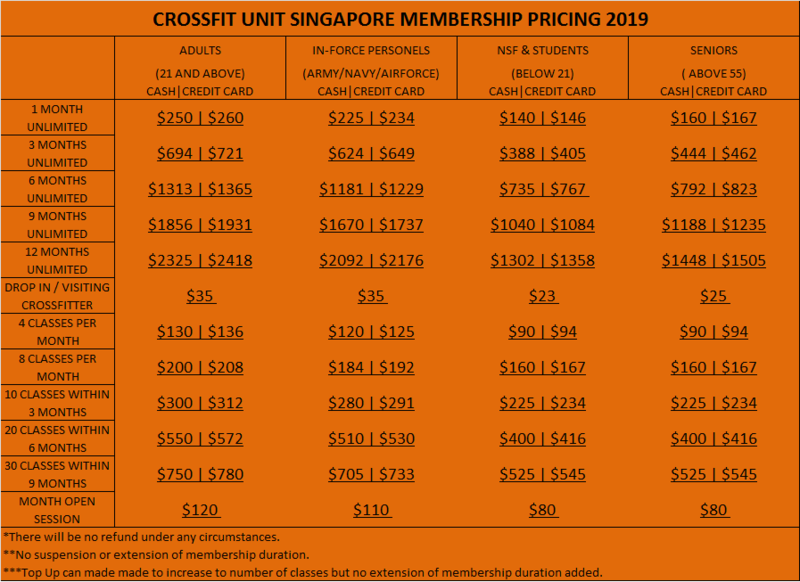 CrossFit Introductory Class is a simple single 60 minutes sessions to allow one to kick start CrossFit @ The Unit in a subtle manageable manner. As Warm-Up and Mobility, 4 Basic movements of CrossFit (Air Squats, Pull Ups, Push Ups and Sit Ups) will be guided and exercised followed by a 10-15 minutes Skill/Strength Teaching. A simple Workout Of the Day (WOD) will be introduced, usually spanning over 5-15 minutes and last but not least, Warm-Down will be conducted to end of the Introductory Class. Please feel free to clear your doubts at the end of the session. Each Introductory Class per person is priced at $20. For Intro Class Sign-up, please check the Introductory Class Schedule HERE and contact us via HERE or text 81110722. 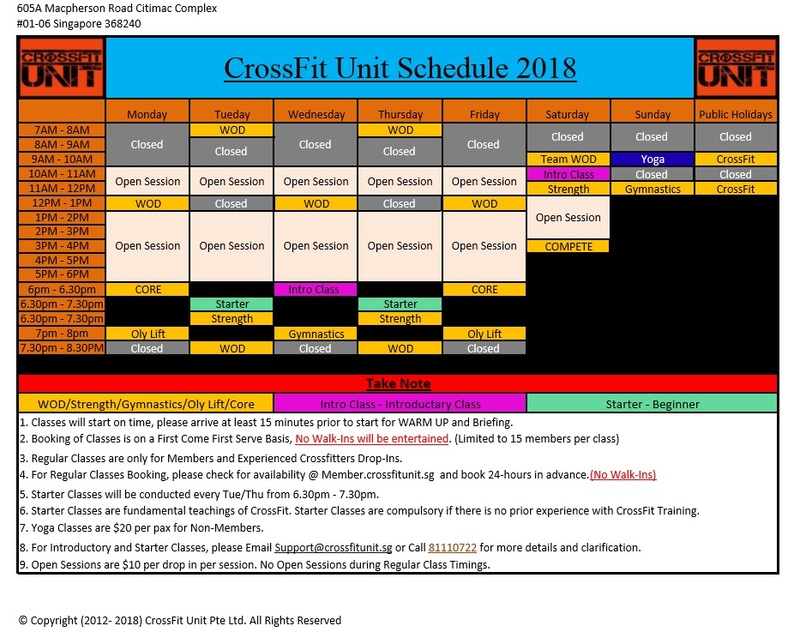 Now comes the nitty gritty stuff, Starter(Beginner) Classes will consist of 2 classes, each focusing on weightlifting techniques, CrossFit exercising postures and movement forms. Each class will span over 120 minutes; guidance towards preventing tension, stress and unnecessary injury to the body and joints will be taught. Starter(Beginner) Classes will have to be completed in 1 weekend(Sat & Sun, 2-4pm) to ensure that participants fully understand and follow-up with the fundamental movements as promptly as possible. Pricing for Starter(Beginner) Classes Classes will be S$200. Each class course is limited to 10 trainees. For Starter(Beginner) Classes Classes Sign-up and Arrangement, please contact us via HERE or text 81110722. Regular classes are spanned over 60 minutes and are constantly varied and challenging. Workouts will never be the same with CrossFit Unit’s family behind your back. Each Day will comprise of a specialty strength/skill from Compound Strength, Olympic Lifts, Gymnastics or Yoga, come in and get surprise with what you will learn and accomplish. Never get bored with working out and be always aware of the next level of fitness you are targeting. Get up and start moving right. Please fill up the Registration & Indemnity Form (PDF) before coming for our Introductory/On-Ramp/Regular Classes. Payment must be done before the commencement of classes. We accept Bank Transfer – POSB/DBS, alternatively Cash, Cheque, Credit Card via PayPal are also another forms of payment we accept. All personal and billing data will be kept confidential. For payment via credit card or paypal, please refer to Membership. 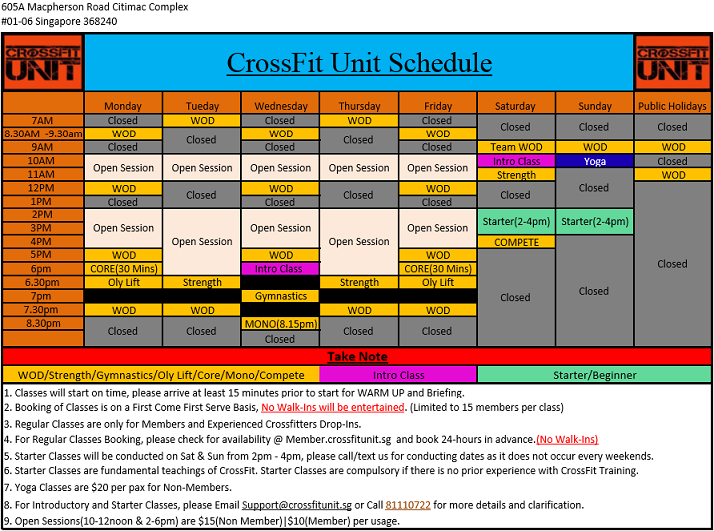 Please email support@crossfitunit.sg or sms 81110722 when transfer is done. Things to take note during class. Please switch mobile phone to SILENT mode. Prevent from being disruptive to others. Please exercise caution and safe practises during classes. Equipment and flooring of CrossFit Unit are to be properly kept and dried. Exercise post WOD stretching and relaxation.